In this blog post, we’ll teach you how to create your own special, custom location on Instagram. So you can “be” anywhere you say you are. But first, I’ve got a question for you. What’s wrong with the picture below? a) she’s on a green screen. c) The location tag says “The Wisdom of Forrest Gump” – and that’s not a real place!!! It’s “c” – you silly gooses! But here’s a better question…how did she do that?!?! And that’s what this article will teach you. 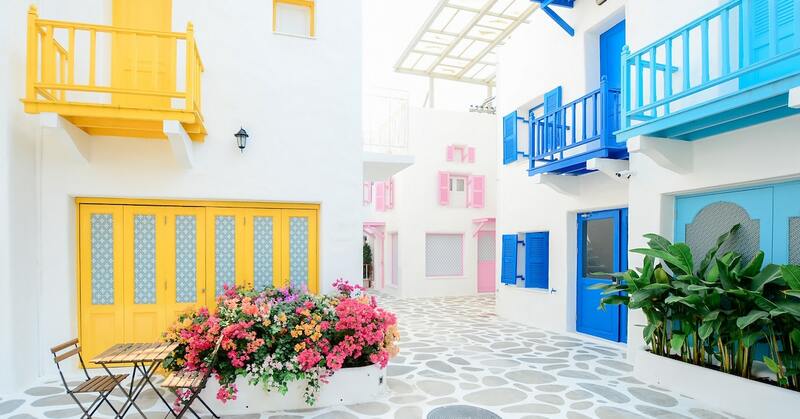 How to create your very own funny, practical, or nonsensical custom location on Instagram. But first, some backstory. (Skip ahead to go right to the step-by-step-instructions). In the age of social media, our society has a growing curiosity concerning the whereabouts of our friends, our families, even our exes, estranged aunts and childhood bullies…. We wonder what they’re doing out there. What are they up to? Where are they eating? What’s that restaurant they posted from while on a date? Of course, you’ve seen those you follow on Instagram tag their location, or your friends on Facebook “check-in” to a restaurant, coffee shop or some other attraction. And, if you’re anything like me, you’ve probably clicked on one or two (or 35) of those location tags to check them out, wondering what those paces offer and why they’re popular with our friends. With every location tag we follow to a venue’s social media, directory or web page, that business suddenly has our engagement — which is an opportunity for them to gain new customers. If you’re a business owner, this last bit should have gotten your attention, at the very least! Did you know you can create your own custom location for your business? And that your location can be tagged, shared and followed by users who are interested in your content? You don’t need to be a business owner to create a custom location. 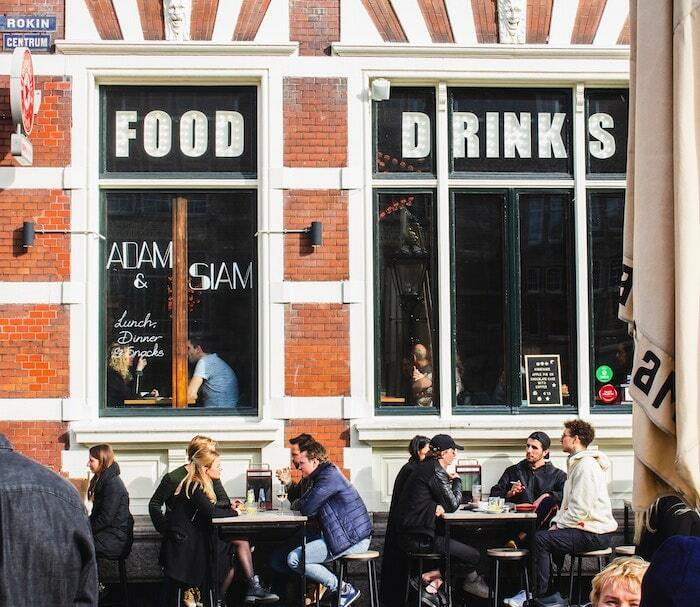 Locations can be a great way to have fun with your Instagram feed or give your followers some additional insight. For instance, an Instagram family might want to create a custom location for their house and title it, “The Bungalow.” Or a group of friends could create a custom location called, “The Hangout.” The opportunities are endless. 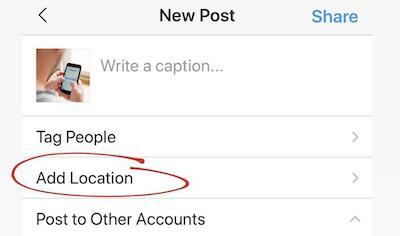 In order to get a custom location on Instagram, you’ll need to head over to… Facebook? Yes, you heard correctly. Since Facebook bought out Instagram in 2012 (for $1 Billion), the two social media titans operate on the same system. This means you often need one to access certain functions on the other. Creating a location is a prime example. You will be setting it up on Facebook so that you can use your new location on Instagram. On the Facebook homepage, you should see a “Check In” button located underneath the status bar. You need to have your location services turned on in order to create a custom location. 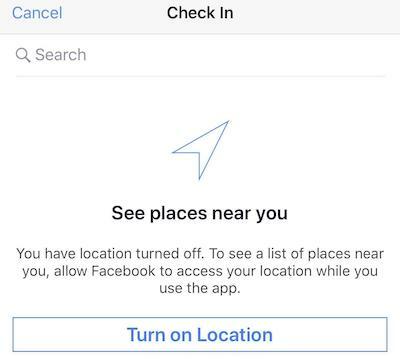 You can do this by going into your Settings > Privacy > Location Services and allowing your Facebook app to know your location. Once your GPS permissions are turned on, go ahead and type in the name of your custom location (in most cases you will want this to be the name of your business). Make sure to use capital letters and proper grammar — this is what people will see when they tag your business! Ignore any other locations that auto-populate while you’re typing in your custom location. Instead, find the “Add Location” option, located towards the bottom of the Check-In screen. 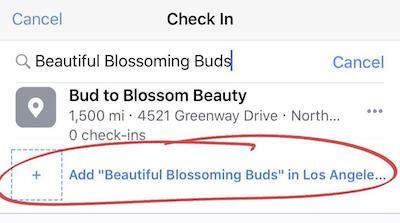 For the sake of this tutorial, let’s say I own a flower shop called Beautiful Blossoming Buds. As you can see, there are no other businesses or locations with that name. Note: If you find your location name is taken, get creative with your new name. Use keywords that allow your audience to know what your business entails. The more specific, the better! After clicking on the “Add” button, you’ll be taken to a prompt to pick a category for your location. It’s important to choose an accurate category so people can find your business when searching in your niche. For my example, I chose the Floristry category for my business, Beautiful Blossoming Buds. Do that and you’re done! 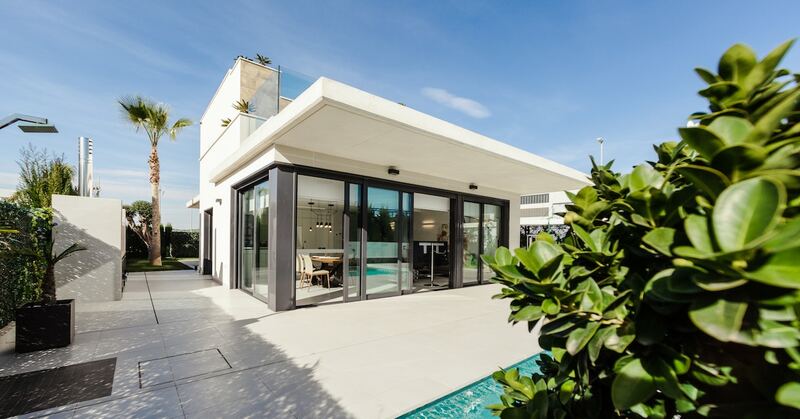 Creating a custom location is a super-simple process with a lot of payoffs. 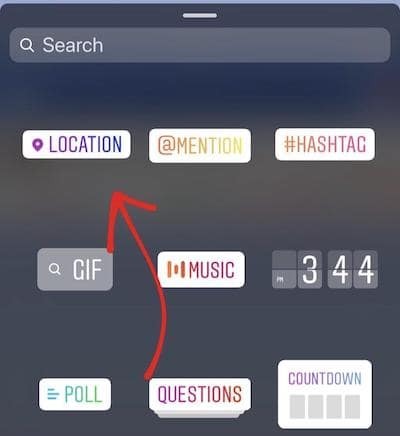 Now when you want to post a photo on Instagram, your new location should now be available to tag and share. 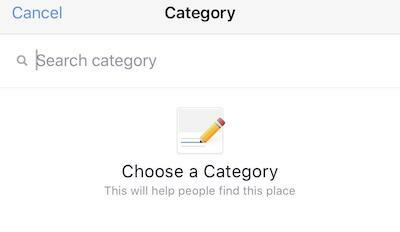 Test Out Another Category: Facebook really wants you to be specific with the category your business falls under. Play around with a few different categories and see if that does the trick. Be in the Exact Location – or really, really close. Custom locations tend to work better when you’re creating one in the exact spot of your business. If entering in an address from elsewhere didn’t work, try creating the location while you are physically there. 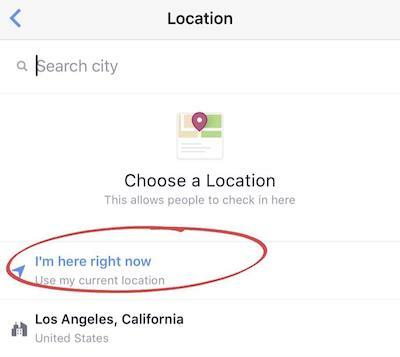 So why should you bother creating a custom location in the first place? Does it really affect your business that much? Above all else, a custom location creates exposure for your business, literally putting it on the map for social media users. More exposure means more customers and more customers leads to more profit …that part’s kind of a no-brainer. For starters, potential clients and customers will have an easier time stumbling across your business. Locations work in a similar way to hashtags. When a user searches a particular word or phrase, any hashtags containing that word or phrase populate. It’s the same process with locations. Let’s say I’m sitting in my apartment in Los Angeles, and I want a cup of coffee. Maybe I want to try out a different coffee shop I haven’t been to, or I’m new to the area and looking for local businesses. I’m going to use Instagram to find a business that sells coffee. 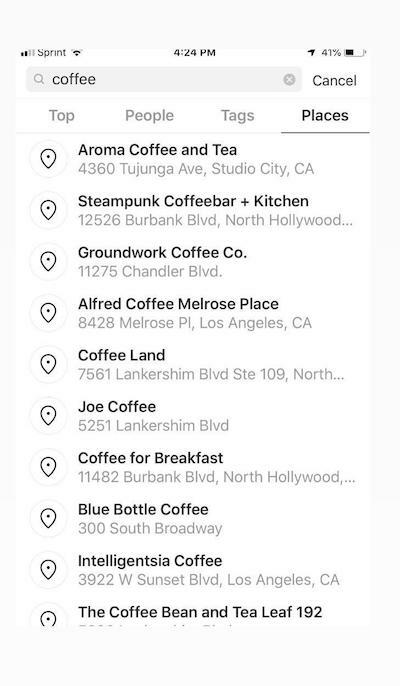 As you can see below, a simple search of the keyword automatically generates a list of all locations near me that make and sell coffee. When you create your custom location, your business will appear in search results and increase the chances that someone might stumble across it and try it out. Instagram Stories is another way you can use a custom location to increase your reach. The Stories feature continues to grow in popularity, and it’s easy to see why. Through this platform, users can easily upload photos or boomerangs, tag friends, use hashtags, countdowns and share their location. Allowing your business to be tagged by you or, more ideally, by your happy customers, is an easy way to spread the word about your products and/or services. Higher Engagement for your Page? And if all that exposure wasn’t reason enough, what if I told you that posts with a tagged location have higher engagement than those without? Well, let’s pretend you are in the coffee business, and caffeine-hungry Instagrams users are searching for coffee shops or coffee-related products like we do. The likelihood you will appear in the feed of someone who enjoys coffee increases when you have a custom location turned on. This is because Instagram can identify your business through your location and category. It can pick up on keywords in your custom location and place your popular content in the feed of applicable users. All this, again, means more exposure for your business without you having to lift a finger (well, after those couple of strenuous finger-lifts involved in that 5-minute Facebook step). A custom location can be set up in no time, but it will have long-reaching effects on your customers finding you and how, in turn, your business will go forward. It only takes one location tag to lead to an inquiry, leading to a new customer, who makes a new location tag, and your reach will grow on. 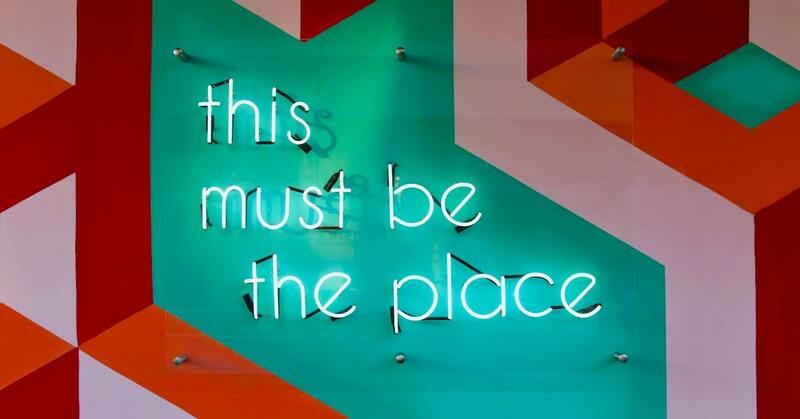 If you’re a brand trying to grow your business, and you haven’t created a custom location for it yet… what are you waiting for? It’s a great way to gain more exposure and spread the word about your products with minimal effort on your part. How many times have you checked out an interesting new location because you saw it tagged on social media?